Don't let the hilarious name fool you. These 9 tracks are performed with true reverence and painstaking attention to detail. An homage to the brilliance of Zeppelin's original recordings; performed with all the passion evident of true fans. Originally begun as a 3 song demo, this project evolved into a full-on research project to discover the recording styles used to capture Zeppelin's original tracks. Sifting through over 3 decades of interviews, finding the gems where Page revealed his approach, the band enrolled in Zeppelin University and received their doctorate in Jimmy Page's Recording Techniques. The result is their thesis, an album entitled: A Tribute To Led Zeppelin From Hell's Kitchen. "This was one of the most challenging projects I've ever had as a producer/engineer...think of it; to create an accurate reproduction of Jimmy Page's late 60's/early 70's analog productions using modern recording gear in my small project studio. Hats off to the boys in the band and to everyone involved.. Enjoy!" Led Blimpie. Your ears won't regret it nor will you! LED BLIMPIE captures the best of LED ZEPPELIN and brings it back even better. Capturing that classic LED ZEPPELIN sound and adding the LED BLIMPIE touch to it. LED BLIMPIE plays an awesome entertaining live show with a perfect sound and stage presence that brings us back to when LED ZEP were in there prime. This album also brings back those awesome timeless LED ZEP recordings that we all adore. I have seen other LED ZEP tributes, but LED BLIMPIE is the best of them all. This album really ROCKS !!! Anyone who loves LED ZEPPELIN will love LED BLIMPIE !!! Hey Hey Mama... I'm Going Down Now! Bookends to this masterfully executed collection of Zeppelin classics. 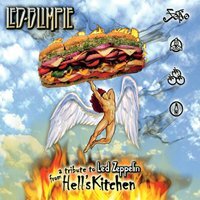 Led Blimpie is simply the best Led Zeppelin tribute band out there and this CD proves it. From Jon's bellowing "Hey Hey Mama" to their powerful rendition of When The Levee Breaks, Thor and the band take you on a journey back in time. Their live shows are electric with an energy that dares you not to groove along. If you haven't seen them, purchase this CD, check out their show dates at www.ledblimpie.com and sign up to their mailing list, then go experience them. You will then understand why my only disappointment with this CD is that it wasn't a 2-disk set with MORE SONGS!! !